The term otosclerosis is derived from the Greek words for “ear” (oto) and “hard” (scler-o). 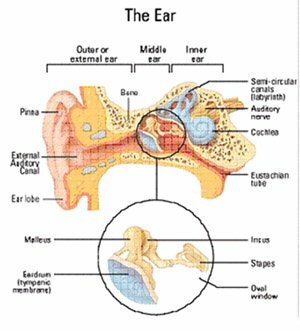 It describes a condition, known to occur only in humans, of abnormal bone activity at the footplate of the stapes (stirrup) bone and the cochlea (inner ear organ of hearing). Because the stapes bone must move freely for the ear to work properly and hear well, the fixation of the stapes bone that occurs in otosclerosis causes mechanical (conductive) hearing loss. If the cochlea is involved, there may be some nerve hearing loss as well. Who gets Otosclerosis and Why? About ten percent of the adult Caucasian population is affected by otosclerosis. The condition is less common in people of Japanese and South American decent and is rare in African Americans. Women are affected much more commonly than are men. However, this disorder can be seen in any person, at any age. The hallmark symptom of otosclerosis, slowly progressing hearing loss, usually starts in the patients’ early 20’s. Over the ensuing several years, the hearing loss becomes more difficult for the patient to overcome. Otosclerosis can affect one or, more commonly, both ears. Approximately 60 percent of otosclerosis cases are genetic in origin. On average, a person who has one parent with otosclerosis has a 25 percent chance of developing the disorder. If both parents have otosclerosis, the risk goes up to 50 percent. Rubella virus has been implicated in some cases of otosclerosis. Gradual hearing loss is the most frequent symptom of otosclerosis. Often, individuals with otosclerosis will first notice that they cannot hear low-pitched sounds or whispers. Other symptoms of the disorder can include dizziness, balance problems, or a sensation of ringing, roaring, buzzing, or hissing in the ears or head known as tinnitus. Because many of the symptoms typical of otosclerosis can also be caused by other medical conditions, it is important to be examined by an otolaryngologist (ear, nose and throat doctor) to eliminate other possible causes of the symptoms. After an ear exam, Dr. Kohan will order a hearing test. Based on the results of this test and the exam findings, she will suggest treatment options. If the hearing loss is mild, Dr. Kohan may suggest continued observation and/or the use of a hearing aid to amplify the sound reaching the ear drum. Sodium fluoride has been found to slow the progression of the disease, particularly when it affects the cochlea, and may also be prescribed. In most cases of otosclerosis, a surgical procedure called stapedectomy is the most effective method of restoring or improving hearing. A stapedectomy is an outpatient surgical procedure done under local or general anesthesia through the ear canal with an operating microscope. It involves removing the immobilized or fixed stapes bone and replacing it with a prosthetic device. The prosthetic device allows the bones of the middle ear to resume movement, which allows sound to properly reach the fluid in the inner ear and thereby improves or restores hearing. Modern-day stapedectomies have been performed since 1956 with a success rate of 95 percent. In rare cases (about one percent of surgeries), the procedure may worsen hearing. When otosclerosis has affected both ears, the ears are operated on one at a time, with a four to six month time gap between surgeries. What Should I Expect After A Stapedectomy? Most patients return home the evening after surgery and are told to lie quietly on the un-operated ear. Oral antibiotics will be prescribed by the otolaryngologist. Some patients experience dizziness the first few days after surgery and will take the medications prescribed for this. Taste sensation may also be altered for three to six weeks following surgery, but usually returns to normal. Following surgery, patients are asked to refrain from nose blowing, heavy lifting, aerobic exercise or other activities that may change pressure in the operated ear. Normal activities (including air travel) are usually resumed two to four weeks after surgery. Water is kept from the operated ear until it has healed fully (about four weeks). Packing is placed in the ear at the time of surgery, so hearing improvement will not be noticed until it is removed at 1 to 3 weeks after surgery. Hearing improvement is usually noticed by 2 to 4 weeks. Hearing is measured at six weeks, and generally reaches the maximum level of improvement by four months. Can I Have An MRI Scan After Stapes Surgery? The prosthetic devices currently in use are completely MRI-safe. You will be given a copy of the device specifications to keep in your files to show the MRI facility in the event that you ever need any type of MRI scan. 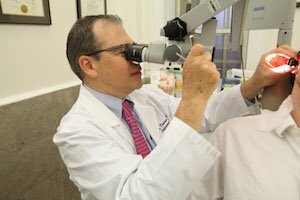 If you have any questions about Otosclerosis or treatment please feel free to call Dr. Kohan’s office for an appointment (212) 472-1300. Dr. Kohan has been honored 14 times as a Castle Connolly Top Doctor. Dr. Kohan is a staff member with the Center for Hearing and Communication. Dr. Kohan is the recipient of the Patients' Choice Award 5 years in a row. An award given to less than 1% of doctors. Dr. Kohan is a featured expert on ShareCare, Dr. Oz's online medical community.